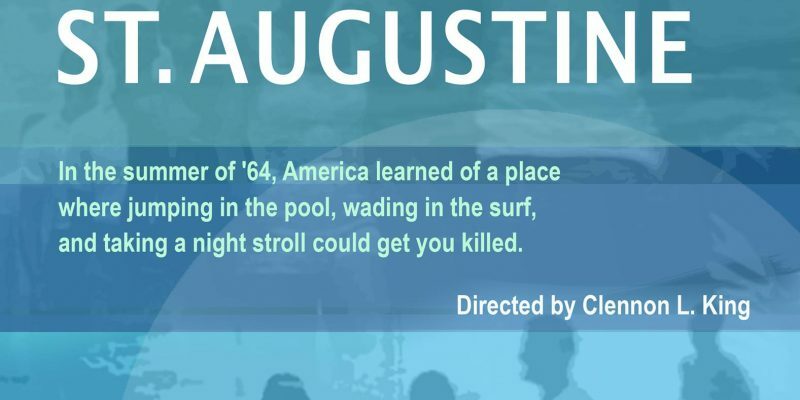 An award-winning documentary, Passage at St. Augustine, detailing the bloodiest campaign of the Civil Rights Movement, which led directly to the passage of the landmark Civil Rights Act of 1964, and included several Mainers – will be featured at a special screening and discussion in on Sunday, September 25th, 4 p.m. at Lewis Hall, Merrill Memorial Library, 215 Main Street, Yarmouth, ME 04096. The screening is FREE AND OPEN TO THE PUBLIC. Maine Coast Waldorf School is co-sponsoring the film along with Marianna Tupper and the First Universalist Church of Yarmouth. Filmmaker Clennon L. King of Boston, Massachusetts will introduce his hour-long documentary. Before entering film-making, King, whose father was a lawyer for Dr. Martin Luther King, Jr. (no relation), was a longtime television news reporter in Dallas, Atlanta, Mobile and Miami. He spent 13 years working on the film, following a four-year stint at the NBC television affiliate in Jacksonville, Florida, located 30 minutes from St. Augustine. Last year, it won the Henry Hampton Award of Excellence in Documentary Filmmaking at the Roxbury International Film Festival, where it was screened at the Museum of Fine Arts Boston. King will be joined by former civil rights student activist Peter Bancroft, formerly of Waterville, and now of Harborside, Maine. Bancroft gave up his spring break during his junior year at Amherst College, to participate in the violent St. Augustine Civil Rights Movement, where he was jailed multiple times. Taken into custody with Bancroft was then-33-year-old Boston University chaplain Rev. William L. England, now of Oxford, ME, who was also brutally beaten by Klansmen. “Courageous individuals like Rev. England and Peter, were key to the Movement’s success,” said King. Last week Governor Paul LePage authorized a proclamation be prepared, officially declaring Sunday, September 25th in the State of Maine “Rev. William L. England Day.” A proclamation will be presented to the granddaughter of Rev. England at the September 25th screening in Yarmouth.